After spending a year on the International Space Station, astronaut Scott Kelly describes The Bahamas as “the most beautiful place from space.” Come down a little closer to earth and you will find these islands will not disappoint. From the fuchsias, and eggshell whites of bougainvillea, the chartreuse of the coco plum, and the vast ranges of turquoise, teal, and cobalt of the glimmering sea, the colors assault the senses with an exploding medley of fearless bolds and gentle pastels. One gets the feeling that Mother Nature gave herself permission to wildly express her artistic side in this corner of the world. Immerse yourself even deeper and you will find the vibrancy of these islands extends much further past the superficial beauty of the landscape, expanding into the hearts of the people themselves. The culture of The Bahamas can be summed up with the thundering of drums, the ka-lik and ka-lak of cowbells, the shrill of the whistles and the blasting of the horns, otherwise known as Junkanoo. The sounds and energy of Junkanoo permeate into your bones. Within the first moments, you will be immersed in a feeling of jubilation so intense, you’ll fear you won’t ever want to return home. Visit during Christmas and New Year’s season to experience this extraordinary cultural festival specific to The Bahamas. The remainder of the year, the Bahamian people tone it down a few notches are eager to share with you the love for their Bahamaland. With a rich history of piracy, rum running and drug smuggling, who wouldn’t be intrigued by this vast expanse of islands, roughly 700 of them in fact. Despite its checkered past, The Bahamas of today offers something for everyone. Mild year-round temperatures and a sub-tropical landscape attracts visitors to these easily accessible islands, especially during the winter months. Within a matter of a few hours, a New Yorker can be stepping onto a sunny beach in the capital of Nassau. World class fishing and diving attracts outdoor enthusiasts and adventure seekers. History buffs will appreciate forts, churches and cottages dating back to the 1600’s. For the gastro-tourist - artisan rum, craft beer and local seafood specialties make New Providence an attractive destination. And for those who just want to relax, The Bahamas is home to some of the most beautiful beaches on the planet. Nassau and Paradise Island, the most visited area of The Bahamas, offer a lively nightlife scene, a variety of dining options, history and culture. Step outside of the booming city, and find yourself in one of the many quaint settlements throughout the country. Island hop The Abacos where you’ll mingle with laid back sailors and anglers; explore Harbour Island by golf cart and rub shoulders with some of the many celebrities that are drawn to the charming colonial town; escape to The Exumas and discover some of the most stunning islands for natural beauty, and feed the swimming pigs while you’re at it. Get off the beaten path and visit Inagua, home to the largest nesting grounds for the West Indian pink flamingo, peruse through plantation ruins and old stone churches in Cat Island, and visit the site where Christopher Columbus allegedly first set foot in the new world in San Salvador. The deeper you venture into the islands, the more authentic your experience will be. The island of New Providence and its neighboring Paradise Island is by far the most visited region of The Bahamas, seeing roughly 3.2 million foreign arrivals per year by both land and sea, which is approximately half of all of the visitors to The Bahamas. Visitors arrive via cruise ship, personal pleasure craft and yachts, and by private and commercial aircraft. No matter what your interest is, you will probably find it. There are fishing and dive charters, day trips to the Out Islands, nightlife, world-class restaurants and of course, beautiful beaches. Atlantis on Paradise Island is probably the most well-known attraction, offering diversions for the entire family such as waterslides, an aquarium, casinos, and periodic big-name concerts and comedy shows. It’s perched on the edge of the famous Cabbage Beach which offers jetskiing and parasailing for the adrenaline seekers. Downtown Nassau offers a variety of options for the history buff and culinary adventurer. It’s also a great jumping off point for day trips to the Out Islands by boat. The quieter Cable Beach area is home to Sandals Resort with their adjoining private island, and several other all-inclusive resorts. The historically residential side of Western New Providence has recently begun to attract both visitors and locals with variety of ethnic restaurant choices from traditional roadside Bahamian fare to upscale Thai and Asian-fusion. Less frequented beaches dot the northern and southern shores, and boutique hotels offer a posh and private retreat for the more affluent traveler. 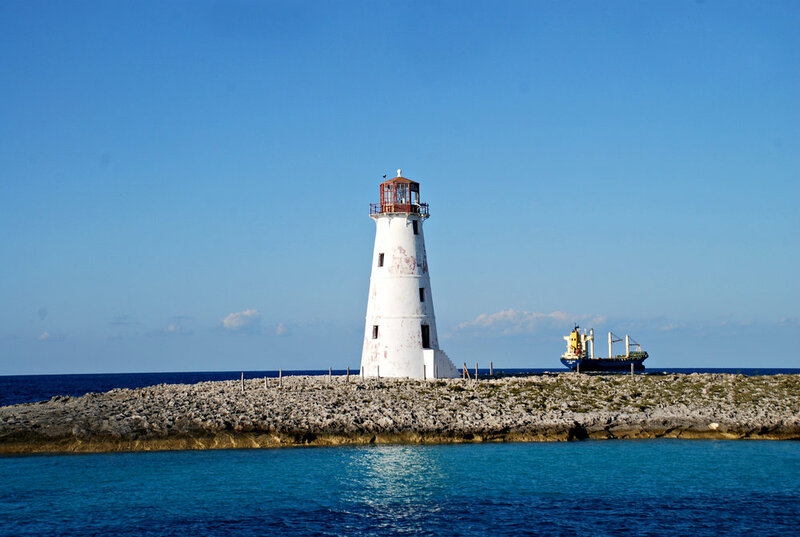 If you’re looking for an easy day escape, Rose Island and Blue Lagoon Island are a short boat ride from Downtown Nassau. Although Freeport may have seen the height of its glory in 1960s when it was home to a booming financial sector and shipping ports, it has still been able to maintain a lively feel since then. Freeport has casinos, nightlife and world-class dining competitive to Nassau. Where it differs from Nassau is the ability to escape into nature as soon as you venture outside the city. Discover national parks, secluded beaches, quaint fishing settlements, and below the surface - spectacular snorkeling and diving. Historically a far-removed outpost known exclusively as the Big Game Fishing Capital of The Bahamas, Bimini has recently seen a burst in economic development with the opening of Resorts World Bimini. The resort has a sizable marina that can accommodate mega-yachts, a casino and numerous dining options. Bimini is frequented by boaters from South Florida as well as a high speed cruise ship that runs several times per week bringing thousands of visitors. It’s home to the supposed Lost City of Atlantis, a popular dive site. A haven for sailors and sports fishermen, The Abacos see regular visitors from neighboring Florida since it’s an easy weekend getaway, and increasingly popular are those on a winter long hiatus. Marsh Harbour, the third largest city in the country, offers all the amenities you might need. But as with all of the islands of the Abacos, there is a stoically maintained laid-back, barefoot vibe. Use Marsh Harbour as a starting point to explore the many islands and cays throughout the Abacos, each with their own unique charm. With direct flights from the US, Eleuthera is one of the most accessible Out Islands, but feels a world away. The 110-mile-long island has charming settlements, natural sights and remote beaches. Skip over to Harbour Island by water taxi and cruise around in a golf cart while admiring the colorful colonial cottages along the picturesque harbor. Dine at some of the best restaurants in the country, overlooking the 3 mile stretch of Pink Sands Beach. Traditionally a fishing and lobstering village, Spanish Wells has seen major growth in recent years as the younger generation has caught onto tourism. Newly opened restaurants, bars and boutique accommodations make Spanish Wells the new “in” place to vacation. If you want to get lost in the beauty of The Bahamas, head to The Exumas. Use George Town as your starting point to explore these beautiful and rugged islands. Fly into Staniel Cay to visit the famous swimming pigs, snorkel Thunderball Grotto and pet the friendly nurse sharks at neighboring Compass Cay. The best way to explore these islands is by boat, but don’t worry, boat rentals and excursions are readily available to show you around. Due to their remoteness and sparse populations these islands tend to have a certain rustic charm and have become increasingly popular for visitors looking for an unconventional escape. Their proximity to the US allows visitors to get there relatively hassle-free. These places are for the more adventurous explorer looking to have an authentic experience of the real Bahamas. Travelers may be seeking natural attractions, historical sites, or simply pursuing peace and quiet on an untouched beach. Oftentimes the sense of disconnectedness is the primary lure. The residents are some of the friendliest and most welcoming in the country. Long Island is home to the famous Dean’s Blue Hole, the world’s second largest known blue hole. Cat Island is known for historical landmarks, diving sites, and Mt. Alvernia - the highest point in The Bahamas. Inagua draws avian enthusiasts with its wide variety of birds, and most notably is home to the largest breeding colony of West Indian pink flamingos in the world. Andros is dotted with quaint fishing lodges that attract bonefishermen from across the globe and is a playground for the avid fisher- and huntsman. The Abacos are a 120 mile long chain of islands in the northern Bahamas. A haven for sailors and sports fishermen, The Abacos see regular visitors from neighboring Florida since it’s an easy weekend getaway, and has become increasingly popular for those on a winter long hiatus. Marsh Harbour, the third largest city in the country, offers all the amenities you might need. It's located on the island of Great Abaco, also known as "mainland." Also located on Great Abaco is Treasure Cay, with a breathtaking 3 1/2 mile stretch of powdery white sandy beach which regularly scores points with travel and lifestyle magazines as one of the best beaches in the Caribbean. Further south tucked into a safe harbor is the quaint community of Little Harbour and home of the famous Pete's Pub, Foundry and Art Gallery. Take a quick water taxi to the surrounding islands and explore all that these charming communities have to offer. Hope Town on Elbow Cay is home to the famous candy cane striped lighthouse and one of the oldest colonial settlements in the area. Visit Nipper's on Great Guana Cay and enjoy a cold beer and conch fritters while overlooking a beautiful stretch of white sandy beach. Check out The Yacht Club Pub, otherwise known as The Dollar Bar at The Green Turtle Club on Green Turtle Cay and be sure to try one of their Tipsy Turtle Rum Punches. Explore the boat building history on sparsely populated Man O' War Cay. These islands are easily accessible with direct flights from Florida and Nassau. As with all of the islands of the Abacos, there is a stoically maintained laid-back, barefoot vibe so get ready to relax and unwind upon arrival. Home of the famous Pink Sands Beach, Harbour Island is a destination all to itself. Harbour Island is just a short 20 minute flight from Nassau, but feels a world away. Quaint historic homes, a beautiful 3 mile stretch of pink sandy beach, world class restaurants, boutique shops; there's something for everyone. Briland, as it is known to residents, is approximately 3.5 miles long by 1.5 miles wide and is accessible by a short flight from Nassau, a 5 minute land taxi and a 10 minute water taxi. Arrive at the Government Dock and step into a golf buggy to explore the island. Most visitors are attracted to one of the most beautiful beaches in The Bahamas and are content to lounge under an umbrella and take an occasional cooling dip in the turquoise sea. But if you're the more active type, there plenty to keep you occupied, such as shopping for island treasures, horseback riding, bonefishing, dining and nightlife. Harbour Island was voted “Best Island in the Caribbean” by Travel + Leisure’s in 2015, but has been a hideout for the elite for years. Celebrities flock to the island because of the lack of limelight. Harbour Islanders tend to treat everyone in the same friendly manner, whether you're famous or not, so don't be surprised to be sharing the same dining experience with your favorite movie star, solely because they can fly under the radar. Discover this charming island settlement on the northern tip of Eleuthera. Spanish Wells has always been predominately a fishing and lobstering community, with very little emphasis on tourism. Until a few years ago Spanish Wells was actually a dry island with no restaurants and no hotels or guest houses. Starting in 2013 with the opening of The Shipyard and permission to serve alcohol on premises, the island has grown and evolved into a new hot destination for both Bahamians and international guests. The eager younger generation has provided numerous options for dining, and colonial cottages have been renovated and offered on VRBO and Air BnB. The newly opened Spanish Wells Yacht Haven is a fantastic marina for the yatchies, offering all the amenities with guest cottages and a restaurant. Immediately upon arrival you will feel welcomed as locals smile and wave in passing. Rent a golf buggy and discover quiet stretches of white sandy beaches or venture out to Russell Island and try and find The Sandbar, a great local bar and restaurant hangout. If you're the outdoor sports enthusiast you'll find no lack of charter fishing options to take you deep sea fishing, sportsfishing and bonefishing. Kiteboarders flock to the northern beaches in the wintertime and you can oftentimes find organized groups. There's also the occasional yoga retreat. Newly introduced are Spanish Wells' swimming pigs on a neighboring island, more easily accessible than their cousins in The Exumas. The Exumas are like no where else in the world. If you want to get lost in the beauty of The Bahamas, discover untouched beaches and unending natural beauty, then look no further. This chain of 365 islands runs northwest to southeast starting about 30 miles east of Nassau. They are easily accessible by boat or private aircraft and places such as George Town, Staniel Cay and Highbourne Cay offer charters and boat rentals. The furthest point south in the island chain is Great Exuma and the "capital" of George Town with a international airport and plenty of dining and lodging options. Another more far removed option is to fly into Staniel Cay. Stay at the Staniel Cay Yacht Club or one of the many locally owned guest houses on the island. From there you can visit the famous swimming pigs, snorkel Thunderball Grotto and pet the friendly nurse sharks at neighboring Compass Cay. The best way to explore these islands is by boat, but don’t worry, boat rentals and excursions are readily available to show you around. Further north is the Exuma Land and Sea Park with headquarters at Warderick Wells. There are private islands along the way but expect rugged natural beauty, plenty of snorkeling spots and limited people other than yachters and sailboaters. The Northern Exumas boast dramatic natural beauty and few inhabited islands, but are easily accessed by a short 2 hour boat trip from Nassau. Visit the iguanas at Allan's Cay and stop by Highbourne Cay for lunch at their picturesque restaurant 'Xuma overlooking the ocean. With direct flights from the US, Eleuthera is one of the most accessible Out Islands, but feels a world away. The 110-mile-long island has charming settlements, natural sights and remote beaches. Derived from the Greek word for Freedom, Eleuthera evokes a sense of freedom to this day with its expanse. It has history as being one of the first place that European settlers started expanding. The Eleutheran Adventurers arrived in 16.. and were shipwrecked on The Devil's Backbone on the northern point of Eleuthera. They hid out in Preacher's Cave for 1 year while their dingy skiff returned to Bermuda for help and additional supplies. They eventually established settlements in Spanish Wells and Harbour Island, where the majority of their livlihood came from a shipwrecking industry. Dispite the bustling settlements on the neighboring islands, Eleuthera has maintained a quiet, peaceful and natural charm about it. Surfers come to Gregory Town and to Surfer's Beach to take advantage of the year round surfing scene. Governor's Harbour is the main town located centrally on the island. Local farms such as E.I.O and ... provide produce to restaurants and farmer's markets. Eleuthera is home to the famous sweet pineapples. Visitors flock to the capital city of Nassau and neighboring Paradise Island for nightlife, restaurants, beaches and watersports. Atlantis has been the gleaming gem of the area for 35 years, delighting visitors with an unending list of diversions for all ages. Downtown Nassau offers a variety of options for the history buff and culinary adventurer. It’s also a great jumping off point for day trips to the Out Islands by boat. Cable Beach is perfect for families who would like the ease of stepping off the plane and onto the beach within a matter of minutes. The quieter side of Western New Providence offers fantastic upscale ethnic dining options, boutique hotels and less crowded beaches. The historic downtown Nassau is a great starting point to getting the real feel for the island. Tour museums, old forts and a wide range of dining options. This is where the cruise ships dock and the vibe is moer of a vacation, party scene. The Straw Market is a great spot to pick up souviners to take home. Potters Cay can find freshly made conch salad and a cold Kalik while listening to local bantar, domino slapping and occassional rake and scrape music sessions. Head out west to Cable Beach and the less bustling areas of the island. The further you venture west, the more far removed from the bustling action of cruise ship docks and tourists. The less visited Love Beach is home to the newly re-opened Nirvana bar and restaurant. One of the only establishments right on the beach. You'll feel like you're in the out islands when visiting.